CSO Yachts announces a €500,000 price drop on the 37m motor yacht Passionata. Built to ABS class by Ferronavale in 1990, she was extensively refitted in 2009 and has had a number of upgrades since. Boasting vast interior spaces, Passionata accommodates eight guests in two large double and two twin staterooms cared for by six crew. Twin 476 Deutz engines give her a cruising speed of 12 knots and a range of 4,000 nautical miles. Water toys include a tender, two Yamaha waverunners, a kayak, waterskis, snorkelling gear and fishing tackle. 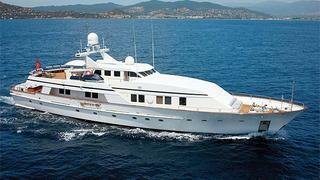 Lying in the South of France, Passionata is asking €2 million, VAT paid.